Christian Louboutin was born in Paris in 1963. He attended the Academie Roederer in the late 1970s, and then traveled to Egypt and India, eventually returning to Paris in 1981. 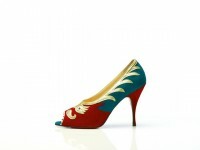 He began working for designer Charles Jourdan and met with Roger Vivier, the purported inventor of the stiletto. Louboutin spent the majority of the 1980s working as a freelance women's shoe designer for various fashion houses, including Chanel, Yves Saint Laurent, and Maud Frizon. He opened his first salon in 1991, with Princess Caroline of Monaco as his first client. His handmade footwear designs are famous for their red-lacquered soles, and the brand has become synonymous with luxury worldwide. 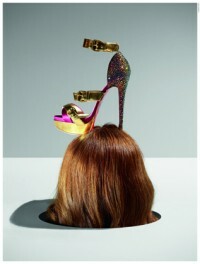 Christian Louboutin was published by Rizzoli New York in October 2011. This monograph features an elaborate foldout cover and covers his biography, career, designs, personal life, and creative collaborations. It features the photography of Philippe Garcia David Lynch.